As someone who doesn't read much mainstream contemporary romance, I was hooked by the blurb for The Ones Who Got Away. This series features the survivors of a school shooting, more than a decade later, learning to deal with survivor's guilt and move forward in their lives. While I suggest reading the first installment in the series, The One You Can't Forget could easily be read as a standalone. First and foremost, I need point out how this is not fluffy but it's also not nail-biting emotional stress, either. While Rebecca is suffering from PTSD, survivor's guilt, and shame for her behavior back in high school. The emotional gut-punch rides just beneath the surface. Not too light. Not too heavy. Perfect for a wide array of romance readers who need a realistic portrayal. Rebecca is a divorce layer, more than jaded and pessimistic after growing up from being a believe-in-fairy-tales teenage girl. She was the good girl. The girl next door. The girl who had an unrequited crush on her best friend. The girl everyone assumed had it all. But that is not Rebecca at all. The novel starts out during another traumatic time, one that freezes Rebecca. To the rescue comes a stray dog and a down-on-his-luck chef. Wes brings that delicious angst that romance readers eat by the spoonful. Brooding, wounded, yet a man driven to make his dream reality... and Rebecca is the lawyer who single-handedly took his dream away. Wes and Rebecca shine the most bantering during the getting-to-know-you stage of their friendship. They're drawn together, even with this being their second chance after a not-so great first impressions. Another layer of angst is Rebecca's perfectionist, controlling, smothering politically minded father. Wes teaches underprivileged kids how to cook, and this draws a dark and gritty reality at how many youths who are forced into crime to survive. With many layers, what reads as a mainstream contemporary romance is much deeper than the surface. The romance is warm and sweet, yet intimately realistic as the pair moves from friendship to more. But there is heavier subject matter that gives just enough to develop a well-rounded, realistic, and enjoyable novel. Why 4 instead of 5 stars? When I compare the first book to the second, my feverish need to click the pages wasn't there. I wasn't as emotionally invested in Rebecca and Wes. The first felt inspired, and this felt as if it was Rebecca's turn for a book but there was something missing – a flatness, fill-in-the-blanks feel. The specific characters, the angst, and newness of the first installment hooked me more, resonated with me. I did have a difficult time connecting to Rebecca or Wes. While realistic, I didn't think Rebecca self-sabotaging or spineless, so the conflict that arises didn't fit the character. I was satisfied and happy at the 60% mark of the story, and felt it meandered and created manufactured conflict to rush toward an ending. Since this book was more focused on the narrators, there was little to no scene-time featuring the fellow Long Acre survivors, which took away from that need to know what happens next sensation I absolutely adore. Highly recommend, I'm more than eager to read the next installment. This is the second book in the series, and I would highly recommend that you read them in order. I have a feeling that if you read this as a standalone, you would still think it a really good story, but miss quite a bit of the context. Both Wes and Rebecca have tumultuous pasts, and in fact, whilst the shooting had a huge impact on Rebecca, it is not the only difficulty that she faced as a teenager. Her mother left for another man, and her father piled on the pressure of expectation. She has, however, been harbouring a secret about the shooting that never really leaves her and has affected her life and relationships ever since. She is now back in contact with a group of survivors, thanks to the documentary, which features in book one. We learned a little there of the guilt that she still felt. Wes also has a checkered past but is finally coming out the other side. He has lost the trust of his family and is determined not to make any more mistakes. As we get to know him better, it is easy to fall for him, as life has not been kind. Somehow these two very different people provide a friendship to each other which is even more important than the chemistry, although they can't deny that for long either. There is no doubt that the romance builds in a bit of a whirlwind, and one cannot help but worry about their state of mind or heart. 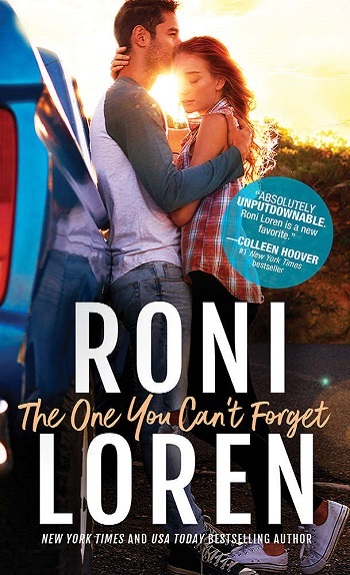 However, Roni Loren has plotted this book with great skill, and ensured that we feel the passage of time to fit their emotions, rather than the other way around. It is always believable and very desirable. By the time you have thrown in an injured stray dog, an abused teen who needs support, and a bright yellow bus, this is a very enjoyable and uplifting book to read. 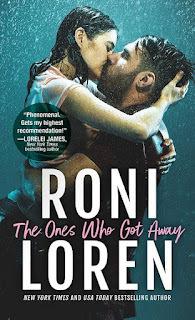 Reviewers on the Wicked Reads Review Team were provided a free copy of The One You Can't Forget (The Ones Who Got Away #2) by Roni Loren to read and review.